Alas, the magical shopping fairy never arrived, and I’m still waiting for the osmosis to happen. (Does it count that my favorite shoe store is called Osmose? I do like shoe shopping, after all.) But I still admire Parisian women’s flair, like that of style icons Clémence Poésy and Lou Doillon, who are the darlings of French fashion articles (I guess I’m not very original). When I was in my 30s, I loved shopping. But now I’m repulsed by the thought of unruly Parisian crowds and long lines for a dusty dressing room. Actually, these are the only lines in Paris that people actually respect. After all, who wants to risk crossing a parisienne and her potential fashion finds? Another bémol, or flat note, is the lack of any available colors other than black, gray, or dark black, and this, in the City of Light. It’s a well-known fact that Parisians love wearing black. Sure, it’s a slimming color, even if it is a bit gloomy to see colorless throngs on the boulevard St. Germain. 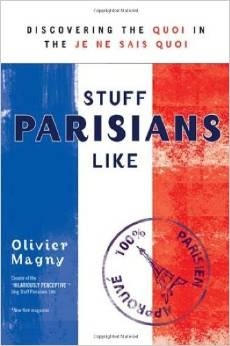 But what fashion magazines and style books (see Olivier Magny’s humorous book, right) don’t tell us about is the other dark side of the Parisian wardrobe. Why do Parisians really wear all that black? One concern is space. My friends in the States all seem to have gigantic dressings, or walk-in closets, but in Paris, closets are rare. And sometimes they contain other, more essential things, like refrigerators (no joke). Many of us store our clothes in old-fashioned, too-small armoires. Here at home, ours is about to explode. The clothes are packed in there so tightly that freshly-pressed shirts come out the next day looking like crumpled paper lunch bags. The result of less space is that wittingly or not, Parisians adhere to the capsule wardrobe principle and buy fewer clothes. And they wear those same clothes pretty much all the time. But if you wear hot pink pants every day, it gets kind of obvious, whereas a basic pair of black slim pants are a little less noticeable. Je ne sais quoi = dirt? And what if the other reasons women wear black are also a lot less glamorous than we thought? People from other countries feel anxious, or complexé, when they compare themselves to Parisian women: so chic, with that je ne sais quoi. What if that “I-don’t-know-what” is that black shows dirt less than colors do? Without judgement, or getting into the “French people’s hygiene” discussion that dates from the Middle Ages (when no one, anywhere, bathed very often), a lot of people here really do wash their hair only a few times a week, and they certainly wash their clothes less often than Americans. So what? And anyway, the name of the game is to look (and smell) like everyone else, so first you fit in by wearing black, and then you stun them with your wardrobe “star”: the handsome suede handbag, or a well-fitting haute couture jacket. (If you own an article of clothing from Lanvin or Dior you know what kind of fit I’m talking about, as if it were tailored just for you.) Or just an amazing sautoir, or long necklace (like from this shop) – but rarely a statement necklace, which is too indiscreet. And that’s the whole point: discretion. Calling attention to oneself through clothing or sparkly jewels is vulgar – but charming everyone with your wit and and sparkling personality? Parfait. Or is this false modesty? Many interviews with French fashion icons quote the same thing, said differently each time: “I don’t follow fashion!” which is the French equivalent of “What, this old thing? I just threw it on.” Really? Parisian fashionistas put a lot of effort into looking like they’ve made no effort. But how does that help us, the little people, with budgets, and hardly any time to primp? So a few years ago, I decided that instead of waiting for that personal shopping fairy, or trying to make myself love shopping again, I would simplify my look and in the process, my life. Not only by wearing black, but also by wearing black. And by finding some talented go-to designers. One of my favorite black “star” items comes from Clara Collins. Over the years, she’s done some great pinstripes, which I love. But hers are always done with a twist: for example, with puffy, angular shoulders (here, in white) on a plain button-down shirt. I had the pleasure of meeting the sprightly, charming Clara Collin (no “s” on her real name) for an interview, and to talk about food. A native of Hong Kong, Clara came to Paris, because as her father said, she had “too much joie de vivre” (as if you could ever have too much!) and he called her a “half-filled bucket” which means a dilettante. And yet dilettantes tend to make great artists. So Clara studied at the Beaux Arts here, and then at the École Duperré, the School of Design, Fashion, and Creation. 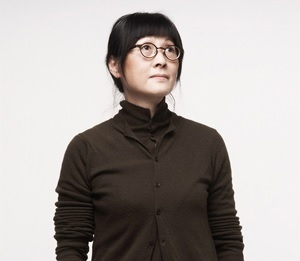 In 1994, she began her company, Clara Collins. One of the reasons I like Clara Collins’ clothing is for its contemporary practicality (not just because she sometimes makes black shirts). Pockets are built into most of her clothing, even if it’s only on one side, and there’s nothing too flouncy or flourished that it isn’t essential city wear. So even though I still don’t relish shopping, Clara Collins and black have made my Parisian life a lot easier. If you don’t like shopping, do you have any tips to make the task more pleasant? Please share in the comments sections below – merci! Clara told me about this great idea for a recipe – and then it just stayed an idea for a while. 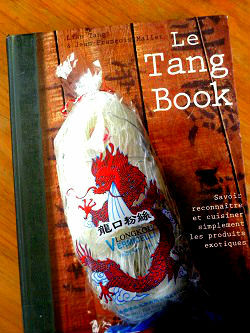 Since I’m trained in French, and not Chinese, cuisine, I looked to the educational Tang Book for help. The book is co-written by Jean-François Mallet and Lian Tang, who shares a name with the most famous Asian grocery store in Paris, Tang Frères. So I should probably be plugging their store. But Paris is thankfully full of offerings in the way of Asian groceries nowadays, and my favorite is Paris Store, which has branches all over France – the one closest to me is in Belleville, at 10-12 boulevard de la Villette, in the 19th district. 1. Cut the beef into fine slices (about ¼ inch or 5-6mm), or ask your butcher to do it for you. I like to put the beef into the freezer for about a ½ hour beforehand – it makes slicing easier. 2. Place the beef slices in a medium bowl, pour 2 tablespoons of the soy sauce over them, and mix well. Marinate this way for a ½ hour. 3. Heat the veal or beef stock to boiling. Rinse the mushrooms under running water, then soak them in the stock in a small bowl for 20 minutes. 4. Squeeze the mushrooms to get rid of excess liquid, and then strain the stock into another small bowl and let it cool completely. Slice the mushrooms finely. 5. Steam the broccoli florets lightly (for about 3-4 minutes) until they are cooked through but still firm. 6. Add the rest of the soy sauce to the cooled mushroom-soaking stock, and in it, sprinkle the cornstarch, stirring to dissolve. 7. In a large sauté pan or wok, heat the oil over medium-high heat until it shimmers, and add the beef slices, working in batches if necessary to make sure there’s plenty of room for each slice and that they don’t overlap. If they look like they’re starting to sputter and boil, don’t hesitate to raise the heat slightly. 8. Let the beef slices brown on one side for about 1 minute, then shake the pan/wok to turn them over, or use a pair of tongs. Let the beef brown on the other side, and take the pan off the heat, and then remove the beef from the pan. 9. Place the pan back on the heat, lowering it to medium, add the ginger and garlic, and cook for 2 minutes. 10. Add the mushrooms, kale, salt, pepper, and broccoli, and cook for about 3-4 minutes. 11. Add the wine mixed with the oyster sauce, and cover the pan for about 3 minutes. 12. Finally, uncover the pan and add the cornstarch-stock mix and the beef. Stir and shake the pan to mix all the ingredients, cooking for about 2 more minutes. 13. Serve right away with white rice or a 3-rice/wild rice medley. Bon app’! Finding a bargain and avoiding crowds always makes shopping more pleasant for me - so I’m finding I do a lot of shopping online these days. I think my technique must annoy retailers though. I wait until stores have 50% off sales, bulk up on 15+ items to get the free shipping, then return 14+ items - oops! I get the stank eye quite a bit! My new other guilty pleasure is StitchFix! You fill out a style survey on your personal preferences and your stylist surprises you by sending 5 fabulous items each month. You return the items you don’t like! Voila! Chic meets convenience! Thanks for your suggestions, Katherine. I’m definitely going to check out StitchFix — that sounds fun! A friend here recently suggested the Habibliothèque which is a kind of clothing lending library, where you can also buy items that you fall in love with (although they look a little pricey). Happy shopping, and thanks for contributing!